All magical getaways are not necessarily located in remote mountains or faraway islands. Some retreats are within easy reach and yet manage to transport you into havens of luxury and calm. When they come in the shape of ancient chateaus, they carry you back in time from the cosy comforts and modern amenities of your home. 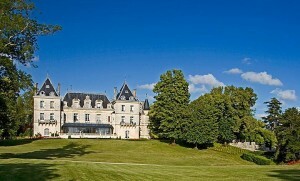 We are talking about the top luxury Chateau Hotels of France here. France as a tourist spot needs no introduction. However, if you want to explore the beauty of the French countryside and leisurely sip wine, head for the lovely chateaus France is justly famous for. Many of the Ancient seats of noble families or royalty have been lovingly restored and renovated into wonderfully relaxing and luxurious holiday retreats. This lovely 13th century chateau in the Beaujolais area captures your imagination at once with its towers, moat and the impressive drawbridge entrance. Set against scenic vineyard forests and hills as backdrop, it has 21 beautifully decorated rooms and suites. Superb service and fine dining are added attractions. A historical monument, the chateau has restored and retained antique furniture and period furnishings and is often considered the finest vineyard hotel in the world. Activities: Ballooning, horse-riding, wine-trail tours, golfing. 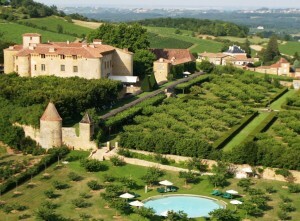 Piece de resistance: Truly breath-taking views of the lovely Beaujolais vineyards and hills! Grandly imposing and stunningly set amidst 7-hectares of a lush landscaped park, this chateau in Reims, Champagne, is a luxury gourmet getaway. 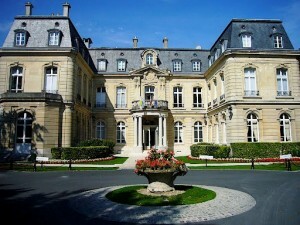 It has 20 elegantly furnished rooms and suites, 17 of them inside the chateau and 3 in the pavilion in the park. Tantalising glimpses of the famed cathedral and basilica of Reims can be seen from some of the rooms. The restaurant (two star Michelin awarded chef), is the focal point of any stay here, serving food that lingers in the memory long after it has been eaten. Activities: Tourist spots – Notre Dame Church, Saint-Remi Basilica, Foujita Chapel; Provins; winery tours; golfing; shopping, tennis etc. Piece de resistance: Superb gourmet fare and a wine list with over 400 champagnes. 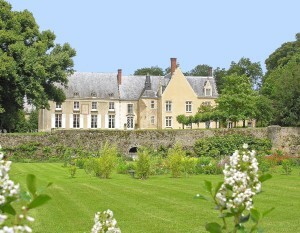 This lovely Renaissance-style chateau is set amidst 8 hectares of verdant parkland. Lying between Cognac and Bordeaux, this grand retreat has 22 luxurious rooms and suites beautifully furnished in the French ‘art de vivre’ spirit; there is antique furniture, crystal chandeliers and rich silk fabrics everywhere. It has 2 swimming pools, 2 tennis courts and a fitness centre. The food is French gastronomy at its best and the service is impeccable. Activities: Local winery tours, swimming, spa, horse-riding, fishing, hiking, tennis, casino. Piece de resistance: The Cognatheque – a room dedicated to wine and cognac tastings with an amazing wine list to choose from. 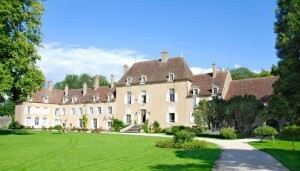 This picturesque chateau lies in the heart of France, in its Burgundy region. Set in 100 acres of green grounds, where peacocks strut elegantly along with other birds, it is surrounded by a moat. The 14 rooms and a suite are all ‘no smoking’ areas. The superb traditional cuisine is prepared from the chateau’s own kitchen garden produce and served under 16th century vaulted ceilings in front of a huge fireplace in the chateau’s dining room. The indoor pool is amazingly located in the chateau’s ancient vaulted cellars. An English-style bar serves a wide variety of drinks. Activities: Explore Burgundy, Morvan National Park, fishing in the moat, croquet, tennis, horse-riding, rafting, canoeing, hiking, hot air ballooning, wine-tastings etc. Piece de resistance: The charming medieval ambience of this boutique chateau with the moat around it. Nestled amidst the hilly wooded countryside of Loire Valley, this scenic chateau with its 16th century fortifications, sits pretty on a 100 acre park land. Beautiful antiques, family portraits, chandeliers, fabrics and fireplaces add to the opulent charm of the rooms. The 3 double rooms, 2 suites and 2 single rooms have all modern amenities and lovely views of the grounds. A superb dinner is served three days a week in a grand 17th century dining room along with the best wines of the Loire valley. Activities: Visiting nearby tourist spots-Loire chateaux, small Loir valley, Le Perche; hot air ballooning; French and cooking classes; horse riding, golfing, wine tastings and archery. Piece de resistance: The owner and hosts Comte and Comtesse de Vanssay who embody gracious hospitality at its best. The Renaissance style Chateau d’Esclimont near Chartres seems straight out of a fairy tale, complete with towers, turrets and a moat and lovely 60-hectare park land. This 16th century property converted into a luxury hotel offers 52 rooms in 5 categories. The rooms with beautiful antiques, chandeliers and paintings have an air of palatial grandeur. All the rooms offer lovely views of lake, park or courtyard. Fifty people can sit in the 18th century restaurant and enjoy the best of regional French cuisine with over 400 wines to choose from. The outdoor heated swimming pool in the lovely setting of the castle and gardens is surely worth taking a dip. Activities: Nearby tourist spots include Chateau de Versailles, Chartres Cathedral, winery tours, hot air ballooning, helicopter rides, golfing, horse riding, tennis, swimming etc. Piece de resistance: The stunning, fairy tale chateau backdrop. Set like a jewel in the rock walls of the 1000 year old ‘museum village’ of Eze, the 400 year old chateau Eza is located on the Cote d’Azur overlooking the panoramic Mediterranean Sea. Most of the 12 uniquely designed rooms and suites have enchanting views from private balconies. They also have Wi-Fi access, televisions and complimentary toiletries. The Michelin starred restaurant serves superb French and Mediterranean cuisines in retractable-roofed, glass-walled dining room or on the outdoor terraces. This is a magical retreat that has it all. Business: One meeting room for up to 20 persons; Internet access, Wi-Fi, fax, copier, equipment rental etc. Activities: Sightseeing (Monaco, Nice), shopping, golfing, horse riding, boating etc. Piece de resistance: The sensational views of the French Riviera from the 400 m high chateau. 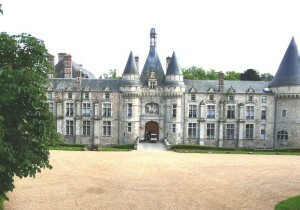 Plan a vacation in a luxury French chateau. Look over your shoulders and see the lingering shadows of a bygone era of kings and nobles, roaring fireplaces, moats, drawbridges, silk tapestries and medieval paintings. Smile gently and look again, and you are back in your beautiful room with the bright sunlight filtering through the windows. Check in into one of these amazing French chateaus and enjoy the best of two worlds!